Is 3D printing going to radically change manufacturing as we know it? I see General Electric investing mega millions in 3D printing of components for jet engines. The top management at GE sees additive technologies as the future of manufacturing. 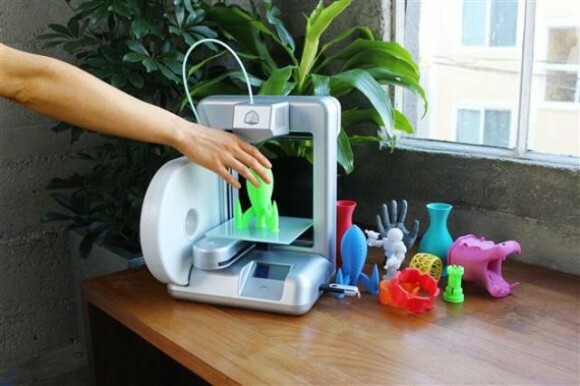 Hewlett Packard sees the 3D printer as their big consumer product of the next 10 years. They think it will stand next to the traditional computer ink printer business as a profit center by the 2020s. I ask you, the smart folks of old school manufacturing, is 3D the next big thing, or just an interesting adjunct technology like wire EDM, Waterjet, and laser? Malcolm Gladwell, the fascinating author of Blink and David and Goliath, calls NFL football a “moral abomination.” He argues that one third of the players will sustain life altering injuries. He sees football losing the interest of young men across the country, except in the Southeast and Texas. He thinks Roger Goodell is clueless about what to do about the players and the sport and that the game is headed toward extinction. I love Gladwell as a writer, but I think he is overstating the case on pro football. The game is still coining money because the TV Networks are starved for programming that reaches a male demographic. The incredible popularity of Fantasy Football (i.e. legal gambling) has given the game an enormous shot of testosterone. But Fantasy Football does not require a live audience. The games could be played without people in the stands and still provide the statistics for betting. Personally, I have lost my taste for NFL games, unless an artist like Aaron Rogers or Peyton Manning is playing. The Chicago Bears bore me. The injuries in every game make me feel like I’m in Rome at the Coliseum watching the Gladiators. I heard an incredible journalistic piece by Ira Glass and cohorts on his NPR radio program, “This American Life.” Glass followed a car dealership, Town & Country Jeep Chrysler Dodge on Long Island, for a month as it attempted to meet the quota of 129 new cars to be sold in October of 2013. He followed the eight salespeople and the sales manager as they struggled to meet the formidable goal, knowing that their livelihoods hinged on hitting that arbitrary number. Chrysler paid a bonus of $85,000 to the dealership each that it hit its quota, but one less car sold meant the dealership received nothing. Commission and bonuses all were contingent upon hitting the magic number. Glass found out that the dealership often lost money on sales toward the end of the month as the salesmen became desperate for deals. He interviewed all of the people on the floor, exploring what made one guy, Jason Mascia, a 28-year-old “sharp dresser” with bursting self confidence and off-the-map drive, outsell every other salesperson every single month. The story absolutely fascinated me from a human interest standpoint, but also from a business point of view. I wrote a piece several years ago for Screw Machine World (predecessor of Today’s Machining World) about a small machining company in Iowa whose management set goals for shipping a preset amount of product each month. If the goal was met, the employees got a shopping spree at the local grocery. Personally, I have found it difficult to set useful sales goals in a used machinery business selling illiquid but valuable used machinery, but I know that other companies do manage to do it. I have set sales goals for Today’s Machining World, but they are more for me than other people. I am curious how folks who read this blog use or do not use goal setting to reach financial objectives. What are the consequences of missing the arbitrary goals? Do you lose good people who can’t stand the pressure? Do you make money because there are marks that must be reached? Question: Are sales quotas useful in your business? yes – sales quotas are useful but mostly in a commissioned based environment. most non commissioned folks are not interested in the “pressure” or goals of sales quotas – therein lies the crux. it seems that those that hit numbers will do so either way (non commission) so an environment of some reward and recognition would be more applicable – to me anyway. having work straight commission and salary in sales – it is plain to me that the guys shooting for bigger money are on commission type incentives – where as the less risk averse prefer the salary type of arrangement . . . I think that 3D printing is going to be big. I believe that they will become a commodity for consumers and many people will have them at home. I plan to get one for home in the near future. As the metal printers gain popularity and the parts are accepted by major OEM’s, they will become very popular. When it comes to complex parts or assemblies, it will be difficult to compete with what the printers can do. Also when it comes to weight reduction, the printers have shown they can produce parts that are 30% lighter than machined parts. I think there will still be plenty of work for the CNC Machines for years to come, but as the technology expands, it will be used more frequently. I was initially enthralled about 3d printers. I bought 2 of them of different kinds (each around $1000) in kit form. But many of the things we printed with ABS would break. either at the first time somebody dropped them, or just sitting around on the workbench they would crack. We played with different fills and many other settings to no better results. and don’t have the strength needed for everyday objects. So I gave up and am getting a wood router to make in wood many of the things I wanted to make in plastic. OK for trinkets, not for real life objects. I own a machine shop with 10 cncs, so am not a beginner at manufacturing objects. My buddy that has a very successful tiny (not small!) machine shop-job shop always says: “Your salesman should be the highest paid person on the payroll. He needs a strong liver and play a pretty good game of golf! !” I think everyone needs to have the ice crackling under there feet and get paid by what’s produced. Most machine shop owners I know are pretty conservative though and don’t compensate based on performance but the traditional hourly/salary method. Wouldn’t it be cool if everyone in the place knew at the end of the day whether they produced more than they consumed. That’s the magic question for all of us owners. Targets are good. Goals are good. Quotas are a good way to destroy your reputation for quality and ethics. I fail to see how 3D printing fits into the manufacturing world with the exception of highly complex (1-off) parts. I keep envisioning a giant factory floor with thousands of these things trying to mass produce something (imagine the maintenance! )…I just can’t get there. Given the tens of thousands of Cartesian moves required to make the average part, the wear factor has to be very significant in the long run. After all, these aren’t robustly built mechanical things like a Davenport. It is still a prototype and specialty method as far out as I can see.